Mr.Yothin Dumnernchanvanit, the President of Double A (1991) Public Company Limited and Maiton Island, co-hosted the welcome dinner for Professor George Benwell, Ph.D, President of The Association of Asia-Pacific Business Schools (AAPBS) and the honorable guests from 20 countries of the 2015 AAPBS Annual meeting in Phuket province. 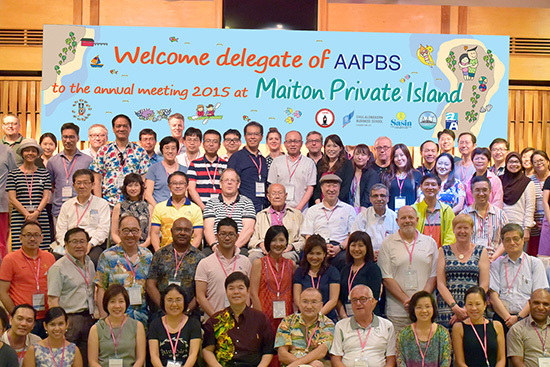 Also present at the welcome dinner were the representatives of the two co-hosting institutions of AAPBS 2015 Annual Meeting, namely Professor Dipak C.Jain Ph.D, Director of Sasin Graduate Institute of Business Administration and Associate Professor Pasu Decharin, Ph.D., Dean of Chulalongkorn Business School. The theme of this year’s annual meeting, “Driving Social Innovation through Public and Private Partnership”, aims to strengthen the collaboration between public and private sectors in creating new educational innovation for the development of business in the Asia–Pacific region.